Traditions are important in my extended family. We get together and eat, enjoying each others' company along the way. As my siblings and I aged, it became harder to circle the wagons on the holidays. Grown grandchildren have a lot of commitments themselves. This year, we're breaking with tradition. My parents are gone. My husband and I are headed to Maui for the holiday. Why? My husband's favorite college basketball team is playing in a tournament that week. So we won't be having a traditional family meal. We won't be sharing leftovers, parceling them out so we aren't overwhelmed. But what does a Hawaiian Thanksgiving entail? I did a little searching and although this doesn't seem to be an exhaustive list, it's an interesting one. If you were joining us for Thanksgiving in Maui, what would you bring? 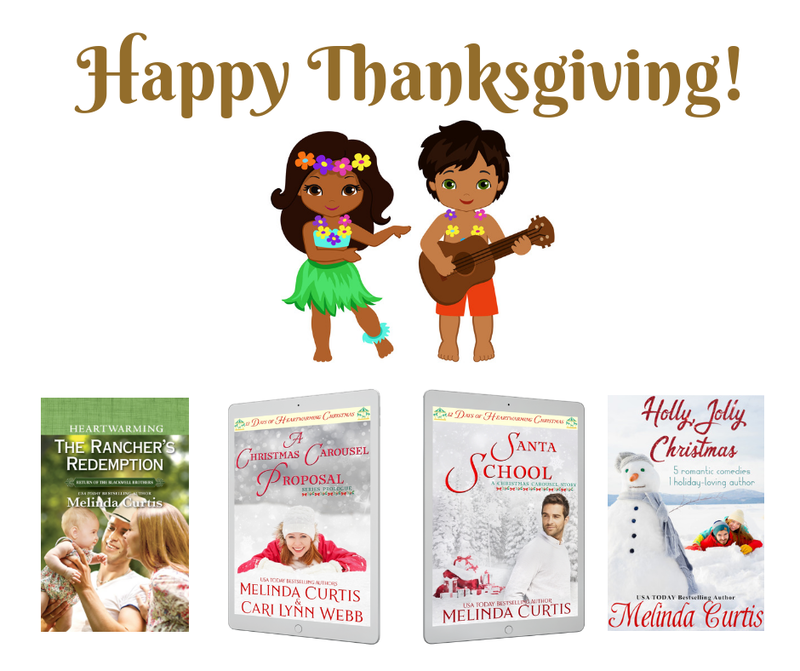 Melinda Curtis is an award-winning USA Today bestselling author of over 50 books. 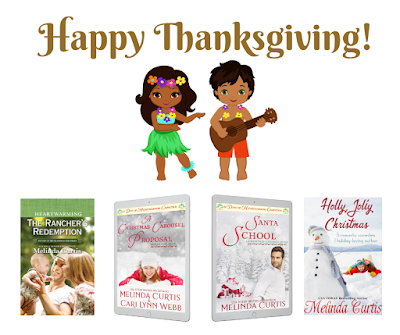 Her latest releases are The Rancher's Redemption, Santa School, A Christmas Carousel Proposal, and Holly, Jolly Christmas. Sounds good! Have a great time. I think occasional breaks with tradition can be good, Melinda, if only to make you realize how wonderful the tradition really is. Hawaii will be lovely and all those new foods....the fruit!...will be a yummy part of the adventure. Enjoy! Have a great time--as someone not attached to many traditions, your holiday sounds just about perfect! Have a wonderful time! We spent Thanksgiving in Hawaii a couple of times when our kids were in elementary school. We usually ate turkey sandwiches at Denny's, LOL. The islands are beautiful then. Of course, they always are. Any time in Hawaii is a great time in my estimation. Having lived there when I first got married, I loved it and went back as often as I could. I still like holidays at home, though. I think I'd just bring myself! Have fun!! I'm very oriented, though I've had a few Thanksgivings that turned out really nice when I couldn't get to the family gathering. One I spent on the beach and though it didn't feel like Thanksgiving, it was a wonderful day. The traditional Hawaiian dishes sound like a tasty twist on recipes we use. But if I was bringing potluck, I'd be tempted to bring my tropical cake (pineapple, banana, coconut, macadamia) or jasmine rice because it sounds good with the meatballs. I've always had to work on Thanksgiving so if I came to your wonderful Maui feast I'd bring a big smile and an empty stomach! Oh, and a nice bottle of wine.